Last night I had a nose bleed at 3am until 4am. The year the space shuttle blew up. The year of the nuclear explosion at Chernobyl. The year in which we went to Anglesey. the year in which I should have tried better to play sport at school. …This is my last entry for 1986. I would like to associate myself with the remarks made by myself 25 years ago today. 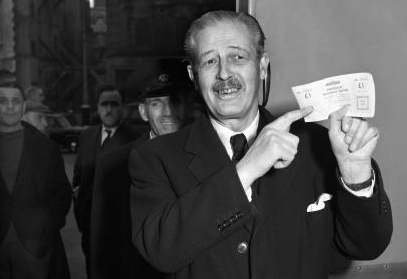 …Harold Macmillan, former prime minister, died today. Macmillan was one of those people who always looked old. Even when he was prime minister back in the 1950s he had the appearance of an octagenarian, albeit a somewhat sprightly one. His death was quite a big deal at the time. He’d become a bit of a one-man anti-Thatcher movement in the House of Lords, likening her fondness for privatisation to selling off the family silver. But as with the similarly-themed verbal eruptions from Ted Heath, I don’t think Thatcher gave a toss. early morning Children’s BBC programmes. a cup of tea – one each, not just the one. We went to Leicester at 9am to spend our Christmas money. an Asterix game book and a book of TV themes for the piano. Then we went to Hudsons, Breezes and Mothercare. For the first seven or eight years of my life, black-and-white television was all I knew. Then a colour set was bought. It must have been in 1983 or even as late as ’84. The very first thing I saw on it, and hence my first taste of technicolour entertainment inside my own home, was an edition of On Safari. I remember being startled by how vivid, not to say lurid, was the gunge in the studio swamp pits. 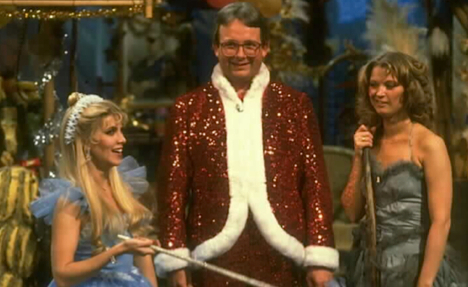 The same went for Christopher Biggins. The black-and-white set, which one of my parents had acquired in the 1960s, was a Grundig replete a dial for tuning into the stations. It now served as the reserve television, where one of us could watch an alternative to whatever was on the main set. In my case it increasingly became an alternative in all senses, as within a couple of years it would be where I went to stock up on the likes of Blackadder, Fry and Laurie, KYTV and others. I always felt much more at ease watching these kinds of things by myself in a separate room away from the others. There was never much communal all-gather-round-the-goggle-box business in our house. Later still I got to take the Grundig away with me to university. It was now over 30 years old but still working perfectly fine, and allowed me to become known in my hall of residence corridor as That One With The TV. Which I suppose was better than a clutch of other alternatives. Two years after that, my sister took it away with her to university, and broke it. …I woke up at 7am and started to read Yes, Prime Minister. I was so engrossed in it that I didn’t realise Muppet Babies had started. I only missed about two minutes luckily. The first volume of Jim Hacker’s prime ministerial diaries was one of my main presents this year. My entry for today tells the reader to find a full list of them “at the back”… but no such inventory exists. As such I can’t go into any further details as to what I received. It was a bit of an atypical Christmas anyway. One of my grandparents was in hospital in Leicester, and most of the days involved visits, usually with the other grandparent in tow. Hospitals are places that take you out of time – at Christmas even more so. The few balloons and strings of tinsel that were evident inside the wards seemed to just subtract from, not compound, any sense of festive spirit. I’m not sure how ill my grandparent was. I suspect the severity of his condition was kept from me and my sister. I certainly didn’t pay his circumstances much heed in today’s entry. Second only to my concern about Muppet Babies was getting back home in time to see Michael Crawford in Barnum. and I’ve had to pay. Yes, that old cop-out. Oh dear. I couldn’t even stretch to “bereft” or, perhaps more challengingly, “cleft”. But it was Christmas Eve, I’d watched – among other things – a repeat of The Box of Delights and the Two Ronnies, and I couldn’t be bothered. I’d bought my sister a cuddly dog, my mum a vase and my dad a map. “They were all cheap.” My work here was done.